Try scanning Test Codes Using AddMe! Don't Forget to Rate 5 Stars and Leave a Nice Review like "Can't wait to start using!" DO NOT DISCUSS ADDME BEING LIVE WITH ANYONE ELSE BUT ADDME STAFF AT THIS POINT IN TIME. Send me a text with your name and "LIVE from AddMe!" for a chance to win some AddMe swag. That's all it takes. 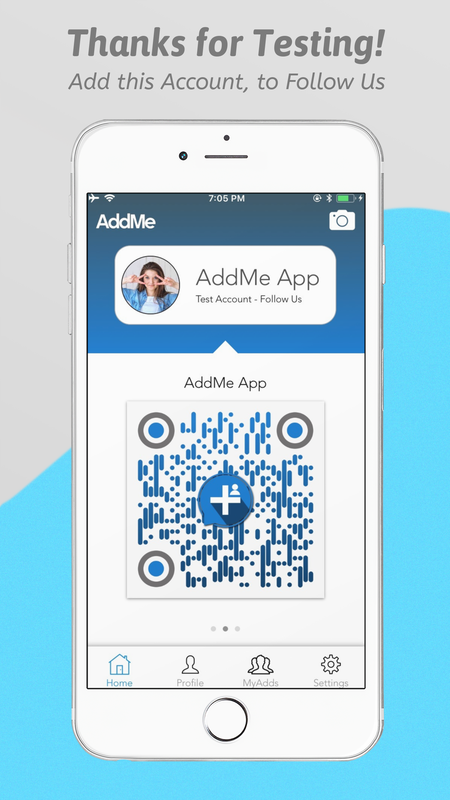 AddMe is designed for people meeting for the first time, but try scanning people around you who created profiles! Report Your Findings / Bugs / Issues. Your Device ID, IP Address, and Location are being recorded to prevent spam. Other questions? Contact an AddMe Team Member.